Service Costs > How Much Does Metal Stud Framing Cost? How Much Does Metal Stud Framing Cost? Metal stud framing, also referred to as steel stud framing, is often used in office and apartment buildings. These frames are lightweight and can resist warping, cracking, twisting and shrinking during and after construction. They are designed to minimize rework and renovation work down the line. In comparison with wood framing, metal stud framing is more environmentally friendly since it produces less raw material waste, lasts longer, and the frame can be recycled. The metal stud framing materials costs will be lower compared with wood, but labor costs are typically higher. Installing metal framing for a house has an average cost of approximately $8 to $13 a square foot. The materials will usually be about 30% of the said cost, which is around $3 to $4 a square foot. The costs will depend on the local geographical region, the current steel costs and who you plan on hiring. While most can offer a standard “per square foot or linear foot” price, a contractor may increase or decrease his or her quote based on the circumstances. If you want to receive quotes from local contractors for your particular job, consider using HomeAdvisor.com. Here, you can explain your job and local, licensed contractors will contact you with free estimates. According to SteelFraming.org, steel framing, using the conventional “stick framing” technique, can add three percent to the entire cost of the house. “Stick framing” refers to a common method of building wood-framed houses, which involves putting together the floors and walls using individual studs and joists on the construction area. If only the framing system is taken into account, a stick-framed steel system can cost 15% more than wood framing. If having the work professionally done, the quoted price should include every aspect of the job. This can include the materials used to construct the frame, the tools needed to do the job, the labor costs for the workers, the transporting of materials to and from the work site, and the cleanup of all debris when the job is complete. Common metal stud sizes include 2-1/2”, 3-1/2”, 3-5/8”, 4”, 5-1/2”, 6”, 8”, 10”, 12”, 14”. Metal stud framing entails the use of other materials such as electrical boxes, plastic grommets, fasteners, wafer screws, and trim screws when installing the structure. These items are usually included if you are paying a professional building company. Otherwise, you will have to purchase them separately. Adding a thermal break is a usual method of dealing with a cold transfer. While it can be a costly component that increases the overall cost of a project, it can yield long-term savings. 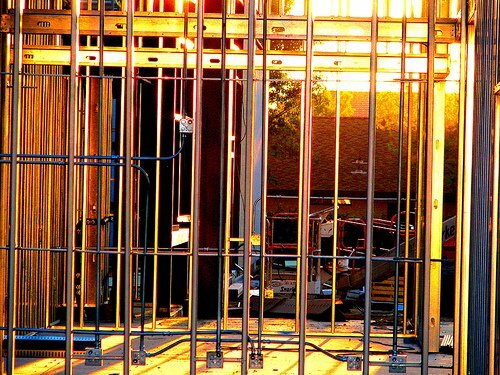 While metal stud framing can be used in homes, it is most often used in apartment buildings or office buildings. Working with metal studs requires special components and devices that are capable of cutting and attaching the studs to the plates. Even if you are capable of doing the work, you may not have the tools needed to complete the job. Make sure that the company you hire to complete the job has experience with metal stud framing. Always ask for references. There is a basic formula for knowing how much material to buy for your project. Buy steel plates for the top and bottom of the wall. Measure the wall’s linear feet and then double it. Add an additional stud for every side of a door or window. Metal studs are sold in a range of widths that are similar to dimensional lumber sizes. Metal stud framing can be transformed into an energy-efficient component. Through proper construction methods and good insulation, the energy efficiency rating can be higher than that of the conventional wood construction. Metal studs, when compared to wood, is known to be easier to install, stronger, repels pests, and based on Steel Framing Alliance calculations, the costs of constructions can be lower. There are many videos and tutorials online that can teach you and walk you through how to install metal stud framing. If given the right tools, you may be able to do the job yourself if you have this kind of experience. Ask about light gauge metal stud framing. This option can be labor intensive, but the materials belong to a lower cost category, which can provide savings.